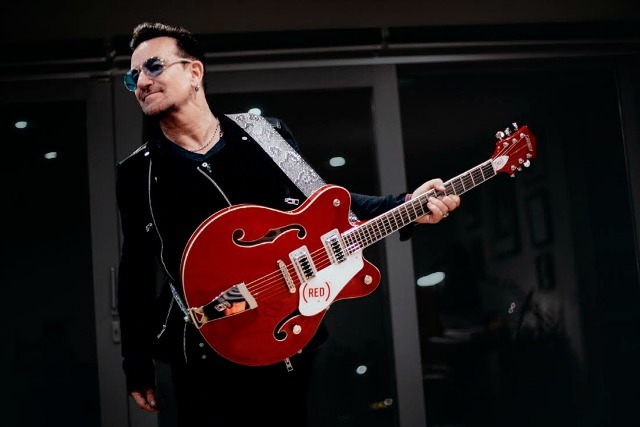 The double-cutaway (GRETSCH)RED G5623 Electromatic® Center-Block Bono "Signature" Model puts Bono's personalized stamp on Gretsch's new thinline spruce center-block design, which delivers "high gain-friendly" tone and greater control over the kind of feedback players want. Other premium features include a bound arched maple top with bound sound holes, maple sides and arched back (also bound), maple neck, 22-fret bound rosewood fingerboard with Neo-Classic™ "thumbnail" inlays, dual "Black Top" Filter'Tron™ pickups with three-position toggle switching, and master volume and tone controls, anchored Adjusto-Matic™ bridge with "G"-cutout tailpiece, Grover® deluxe tuners, chrome hardware and deluxe case. "The (GRETSCH)RED guitar is a guitarist's dream," said Bono, co-founder of (RED). "And the reality is that every time someone buys one, it's raising money to fight AIDS. That money can buy life-saving medicine for pregnant mothers living with HIV, and prevent their babies being born with the virus. They're the same pills that will help deliver an AIDS Free Generation." Since it was founded by Bono and Bobby Shriver in 2006, (RED) has generated more than $275 million for the Global Fund to fight AIDS, tuberculosis and malaria, to support HIV/AIDS grants in Ghana, Kenya, Lesotho, Rwanda, South Africa, Swaziland, Tanzania and Zambia. Global Fund grants that (RED) supports have impacted more than 55 million people with prevention, treatment, counseling, HIV testing and care services.